Audiobooks: Is Listening the Same as Reading? “You cannot borrow any more titles this month” has become the saddest phrase of my small existence. I may be an audiobook addict. My gateway drug was the bargain-bin cd novel. Years ago I discovered many in odd places like Tuesday Morning stores, Big Lots, and very occasionally at Barnes and Noble. It took a lot of digging to find unabridged versions–I will not read or listen to abridged versions of books because they incite moral outrage in me. WHY are there such things? I can see perhaps that once upon a time people read Reader’s Digest abridged versions of classics so they could boast they’d read them with some measure of authority, or in case someone might burst into their house and made them take a pop quiz on Great Expectations or Anna Karenina. But, really, if that happens, you’ve got worse problems than being a slacker reader. After CDs I moved on to iTunes books. I logged on frequently to look for specials, and rarely paid more than $5.99. They were much more portable than bulky CDs. But I got greedy and started buying pricey bestsellers and had to cut myself off. My husband subscribes to Audible. Several of my own books are available on there, but I bristle under the program: limits and specials and points. Mostly, I don’t like to belong to clubs that will have me–especially if I have to pay. For a while, I listened exclusively to free podcast books. One of my favorite sites is the Classic Tales Podcast with B.J. Harrison. I believe all of the audiobooks he reads are in the public domain, making them truly classic. You can subscribe and get the free podcast, but he also has a great library of inexpensive classics. As you can see from the photo above, my audiobook listening is fairly light. I’ve been bingeing on traditional and procedural mysteries. (Ignore the “resume” on the two Beaton books–I suspect I moved on to the next one before the last few seconds played.) HILLBILLY ELEGY has been a kind of in-between book. The first 90 minutes or so made me uncomfortable because 1) I found Vance’s broad statements about history and class attributes random and defensive, 2) he pronounces “Appalachia” with a long, Midwestern 3rd “A”, and it drives me nuts as someone who lived for years in WV and western VA, and 3) I have deep, recent roots in eastern Kentucky, and it felt achingly personal and aggravating at the same time–which is to be expected, of course, because my hillbilly ancestry makes me ornery and skeptical anyway. But somewhere around the 90 minute mark, Vance gets deep into his personal history and it becomes a compelling story. I nearly always have an audiobook on in the car, whether I’m going on a long trip or to the post office. I have one on while I cook or garden or clean. In fact, I’ve been known to engineer solo driving errands just so I can listen to a book in peace. Sometimes I wonder if listening to a book isn’t cheating. Is listening to a book too passive an act to be considered useful to a writer? I’m torn. It occasionally feels like that. I’ve let the first 4 Hamish MacBeth books pour into my ears like mineral oil used to float a bug out. (That’s a thing.) I started my heavy listening of traditional mysteries last spring, in preparation for writing my first cozy novel, and now can’t stop. Thank goodness there are a ridiculous number of mysteries out there. Unfortunately I’ve listened to so many that I’ve found there are some books that are marvelous in audio, but are barely readable on the page. (Not telling. Let’s just say I never tried paper with that author again.) It’s as though my listening brain is so focused on the story that it can ignore the weak writing–something I seriously have a hard time doing when I’m looking at a page. Although magazine and Buzzfeed-type quiz testing tells me that I’m an equally visual and audio learner, I retain stories I hear in much more detail than I do when I read words on a page. Yet the story plays out in my head in much the same way for both–I get to visualize the characters, I get to make educated guesses, I get to participate in ways I don’t when watching a film. And yet. One of the reasons I still read more paper books than I do ebooks is that I am better able to create a mental map of both the book and the story when I can actually touch and turn pages. It feels participatory in a way that swiping never does. Ebook pages are too uniform. They aren’t alive. Now, that’s just my mental eccentricity–I do read and publish ebooks. It’s just that the experience is different. Stories have a shape, and I like to feel the shape so I can create story shapes for myself. If that all sounds a little Montessori Method to you, sorry. It’s the only way I can think to describe it. I do, to some extent, also see the shape of stories when I listen to them. I know. This is starting to sound a little too theoretical. A little too woo-woo. But I can’t shake the feeling that I’m betraying my writer self if I’m not reading words on a page. There are times when I realize I’ve been thinking about something else for a minute or two and have to click back to hear what I’ve missed. That’s not to say there haven’t been many times that’s happened as I looked at a paper book. What say you, dear Zoners? Am I splitting hairs? As writers, do you think there’s a best way to experience a story? 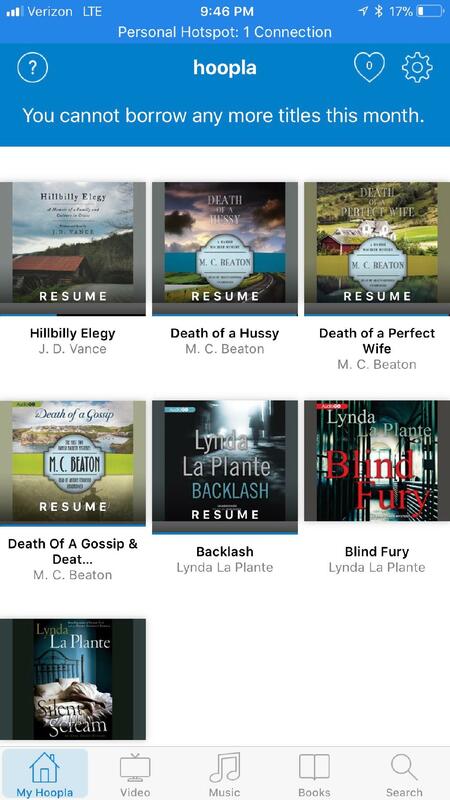 This entry was posted in Writing and tagged audiobooks, HOOPLA, Lynda LaPlante, M.C. Beaton by Laura Benedict. Bookmark the permalink. My traditional publishers made audio formats of my adult & YA backlist. I haven’t loved every one of them. So much depends on the narrator’s talent. Audio is acting without an audience. It can’t be easy. My fav two from my backlist are IN THE ARMS OF STONE ANGELS (Audible thru ACX, Michele Ann Dunphy) & BLOOD SCORE (Audible, James Patrick Cronin). I self-published my audio rights through ACX/Audible & picked my narrator, Michele, whi did an amazing job of bringing my teen heroine to life. On Blood Score, Audible bought rights & I got my first male narrator, Cronin. He did a phenomenal job. But more to the point of your post, one of my fav books, THE BOOK THEIF by Marcus Zusak, was made into film, audio, print, & ebook. I thought they did a good job on the film & enjoyed it. Then I bought the audio & I thought the voice of Death was too old for my take on the story. It didn’t fit with the voice in my head when I read it, but I’m glad I stuck with listening to all of it. The narrator’s acting & accents were amazing, a completely different experience to listen. I loved it equally as much & realized every format can enhance the experience of a good story, well told. BTW, I like to listen to audio as I lay in the dark, before I fall asleep. It’s like someone reading me a bedtime story. Love this post, Laura. Thank you. Thanks, Jordan! I’m glad to hear you had good experiences with your narrators–they really do make all the difference. I also like to listen as I fall asleep, but I always have to go back the next morning because I go straight to sleep. Have you found audio self-publishing profitable? No. Profitability might be there, but I haven’t had time to learn how to market for audio. I imagine it’s a specialty, like writing in a genre that’s not part of your brand. It’s nice to offer different formats and I hear that can improve your sales rankings at Amazon, but it’s only a fraction of what I do. Traditional houses may have departments to cover their catalog en masse, but I would imagine even they don’t have time to dedicate to every project. Libraries would be a focus. I like Dean Wesley Smith’s analogy of having lots of things for people to choose from on your bakery shelves! As for print vs digital — it depends. As an insomniac, there’s nothing better for late-night/wee-morning hours reading than an e reader that lets you change the lighting and the font. And so many print books nowadays run the print so far into the gutters that it’s a physical struggle to read them. Wow–13 audiobooks. That’s a lot, Terry. I’m also cursed with the mind-wandering thing, and sometimes miss critical clues in the mystery. I hadn’t thought about insomnia and e-readers, but it sounds like you’ve found a great companion in your sleeplessness. I am an audiobook addict. I listen while I’m gardening or working out or when I have a long drive going through 2-3 books a week. A print or ebook take me 3 months to read. I have an audible subscription and also subscribe to their daily deal where I pick up about a book once every 2 weeks. I also have Overdrive and RB digital from my local library. I think the best example of audiobooks is the Harry Potter series. I hadn’t read the books nor viewed the movies and I was hooked on HP about ten minutes in. Later I went back to watch the movies and found myself disappointed stopping at the 4th movie. I’ve dabbled in ACX to look at bringing my own books (9) to the audio format, but it looks like daunting work – developing a script, etc… I know it’s been the strongest growing sales channel of books, but finding the right actor is everything. At what point (#book sales) does it make sense to put that effort into audio? Alec – As someone who’s used ACX for 13 books – it’s not really a daunting process, although getting and listening to narrators’ auditions can be time consuming. Your “script” for the audition is just cutting and pasting short chunks of the book you choose so you can hear narrators dealing with whatever you deem important. For me, it was whether the narrator could convey dialogue vs thoughts/internal monologue because I have a lot of that given my books are all written in deep POV. The ‘script’ of the book is your book file. I cut out the end matter, figuring nobody wants to listen to acknowledgments, etc. (Listeners–feel free to chime in!). I’ve got a whole series of blog posts about getting my books into ACX, although it’s a little harder to attract narrators that it was back when they were starting out. Search on To Hear or Not to Hear on my site. Our listening habits are very similar, Alec. I also find it takes me longer to read books in other formats. I say give it a shot with one audio and see how it goes. Sounds like an adventure! While I have no problem publishing in a variety of formats to accommodate different readers and listeners tastes, I cannot deal with listening to books on audio. I have listened to a grand total of 2 on audio. One was War & Peace (& to this day I couldn’t tell you anything about the characters or the story) and the other was a civil war non-fiction book. I did pay more careful attention to the civil war history book and the narrator was excellent, but it still fell short of being satisfying. I have to SEE things in print to process them just like I think better on paper then in a conversation. As someone mentioned above, my mind wanders when I listen to audio & I am never 100% committed to the task, so I don’t get much out of it. Also, just as for me there is a conflict in non-fiction between highlighting in a kindle and being able to scribble all over a non-fic printed book, you can’t do EITHER with audio. I’m glad there are different formats to work for different people. I believe a commenter on Sunday mentioned how critical audio was to them because of visual impairment. And I would assume that shifts your ability to use your different senses. But for me, audio is not something I would choose unless I had to. My mother was blind the last 10 years of her life. She was a ferocious book reader before she went blind. Thankfully, my sisters introduced her to audiobooks. I can’t tell you how much enjoyment it gave her in her final years. It was like a healing salve. What a wonderful story, Philip. Healing, indeed. Love this comment, BK. Listening to War and Peace as one of your first audiobooks sounds like absolute torture! Being able to see feels critical to me as well because processing as a writer involves more than just remembering the story. That’s why I worry that my audio to print ration has gotten way out of balance. I LOVE listening to audiobooks. I always have one going. We’re blessed with OverDrive at our local library and it has an extensive list. Also have a Kindle book and a paper book going at the same time. I try to pay attention to craft, but am almost always immersed in the story. You’re right that the narrator makes a difference. The Harry Potter books were amazing, as were the Louise Penny Armand Gamache books, though the narrator of the first several recently passed and I’ve read the last two instead. Having foreign accents is wonderful, like for The Guernsey Literary and Potato Peel Pie Society – just terrific! The Nightingale also had a delightful voice. I listen walking the dogs, folding laundry, at the grocery store, in the car, even in just a few minute snippets it’s amazing – maybe I’m too addicted as well! Ralph Cosham really did define the Inspector Gamache books, and I was gutted when he died. His voice was both warm and dignified and really complemented the prose. I was skeptical about Robert Bathhurst because I didn’t much care for his Downton Abbey character. But I’m used to him now. He’s different, but fine. Accents can be both good and bad. The reader of my first novel on audio made a lovely, dignified school teacher sound stereotypical hillbilly and it broke my heart. I’ve stopped listening to audio versions of my work for that reason. Laura, I’m new to audiobooks. This past summer, I paid $40 for THE THIRST by Jo Nesbo, but the narrator’s voice irked me so much, I stopped listening. I’ve come to realize that I’m not a good listener. With audiobooks I can’t hear the rhythm of the story, and that’s how I form bonds with authors. I’m an auditory reader and writer. If I can’t hear the way the words sing in my head, it ruins the whole experience for me. I’m also convinced authors should NEVER listen to their own books. One of mine just came out in audio in October, but the voice of the characters sound nothing like they do in my head. I had to stop listening; I found it more frustrating than cool. They sell amazingly well, though. Do you listen to your own books? I too enjoy audiobooks and rarely drive anywhere without listening to one. However, the narrator really makes or breaks the experience. I recently purchased an audiobook and returned it after thirty minutes of listening due to the person’s voice. The book was set in the far future, and yet the narrator had a heavy English accent, something I wouldn’t expect to hear 500 years in the future. To make matters worse, when she performed character dialogue, her voice would get quite high pitched which literally hurt my ears! I ended up returning the purchase. I do not listen, Sue. I had a terrible experience with my first novel and have been afraid to ever since. With the other books, I made a point to listen to a few different examples of a narrator’s work before I approved them. But I still won’t listen. What a terrible experience for your first audio! $40 sounds like highway robbery. I know production costs are high, but I have a feeling they’re high because publishers can get libraries to pay that much. As more go online rather than on shelves, maybe that will change. Yes! The rhythm of the story–exactly. I think there’s something rather magical about the combination of the eyes, the page, and the tactile nature of printed books. Occasionally I listen to audio books to keep me company during a monotonous task, but I prefer paper books for all the reasons you mentioned, Laura. Plus, if I’m browsing in a brick-n-mortar or a library, it’s easy to take a peek at the writing style when you have a paper book in your hands. Can’t do that with an audio book . . . well, you sorta can, but it’s cumbersome! So true, Priscilla! I often cheat and go to Amazon to preview before downloading or picking up CDs at the library. It’s a good way to know if the narrator is decent, too. Audio is the only way I can ‘read’ my own books once they are published. Have no idea why I can listen to them when I can’t read them. 😉 On a side note. I have a friend who attended a workshop with Rick Bragg. Loved his workshop, but he repeatedly pronounced Appalachia with the 3rd long a. She approached him after the workshop and mentioned that those who live in Appalachia pronounced it with a broad a. Not sure if he appreciated it or not or if it made any difference. That’s when I learned how passionate people from Appalachia are about their pronunciation. 🙂 I mean, to correct Rick Bragg? How fascinating, Patricia. You’re very brave to listen to your books. I confess I don’t go back and read mine, either, unless I’m giving a public reading. There have been readings where I’ve caught things I wish I’d been able to edit, and changed them on the fly. Never do that btw–It makes for a bad performance. So funny about Rick Bragg. I bet it wasn’t the first time he heard it. I read so much faster than a narrator can tell the story that I get distracted and miss parts of an audiobook. The same holds true for online courses where most of the content is presented in video or MP3 format. But give me the transcript and I devour it in no time. Plus, I just love the feel of the pages, the ability to easily flip back to the previous chapter to verify something, and the glorious sight of an overfull book shelve. That should be I miss the feel of the pages of an actual book. We had our bookshelves made deep so they can hold three rows–overfull is a glorious sight, indeed! I love audiobooks. I listened to Stephen King’s 11/22/63 while driving from Key West to Las Vegas. I couldn’t listen nonstop, I must admit, so I broke it up into 3 or 4-hour segments. I finished the 30-hour masterpiece on the return trip. From 2013-16, I narrated audiobooks, over 50 titles in all. During that time, I was fortunate to have done some great ones, including I, THE JURY by Mickey Spillane (the only unabridged version of that iconic novel), several novels by Lawrence Block, James M Cain, and noir master Jim Thompson, among others. Heck, I even got to do titles by Jack Kerouac and JD Salinger. They’ve all sold pretty well, but truth be told, I really don’t care to listen to myself. I could never understand why some actors never liked seeing their own movies, but now I get it. I feel very self-conscious whenever I hear myself narrating, and I try to detach myself from it as much as I can. Go figure. Next time you drive to Vegas, you should put in The Stand! I read that years ago, Laura. I bet it’s a first-class audio experience. I will listen to it on my next long trip. Thanks for the tip. I guess the question might be better directed toward people who must listen to books. I used to be a voiceover specialist with credits. I wanted to volunteer my time to read for Books for the Blind, but at the time, they moved the recording studios to Sun City, and that was just too far away for me to travel in those days. It seems to me–and I admit this is a philosophical opinion–that READING is a relative term. Talk to the people who listen to them because they had no other alternative. I think I can safely say they felt as if they were reading, not listening. Particularly if the reader was engaging and pleasant. An excellent distinction, Jim. Reading is a relative term. I was eager to come home from work today and see what other responses were to today’s post. I’ve never formally or informally inquired on the subject, but from the responses here it sounds like more people than ever are listening to books on audio. What I also find interesting is that so many listen to audio books while doing other stuff. I think that’s the difference for me. I have to be paying attention to one thing and one thing only. It’s like Small Business Administration webinars. I try to tune in to learn from the speakers, but of course they only ever offer webinars during work hours, which means I’m lucky if I can give one quarter of my attention to the webinar and as a result I never get anything out of it. It’s the same with audiobooks. Too easily distracted. It is definitely a hot market. My husband, who teaches creative writing, also has his students listen to and write scripts for episodic, scripted podcast dramas. I think digital media has become so convenient that we are all used to having stories at our fingertips–and who doesn’t like to be read to?! Are the SBA webinars the same thing as the SBA web chats? Maybe they’re archived. I am sooooo happy to be distracted from doing laundry or scooping the litterbox! You want an audiobook addict? Here’s your audiobook addict! I listen to audiobooks 3-6 hours a day during my day job (IT guy). Then I get home and sit in a 4×5 box in the dark and narrate audiobooks from 7-Midnight 6 days a week. I’ve narrated over 100 books, including for John Gilstrap, James Bell, and several other members of this blog and other best sellers, as well as narrating the books I’ve written. The shortest I’ve narrated was a 30 minute short about the Battle of Paschendale in WW1. The longest, The Bible, over 72 hours. Currently, I’m narrating a six-book romance/thriller series that’s pretty cool. That said, I realize audiobooks isn’t for everyone, but I really do equate it with reading for those of us who can digest the spoken word as easily as the written word. Two of my sons like audiobooks, one cannot enjoy them at all but loves reading paper (he also doesn’t like ebooks). In regard to your statement about sometimes an audiobook being easier to understand than the written book, I wholeheartedly agree based on my what I have seen in some books I’ve narrated. I recently completed a very long series (averaging about 150k words each) that was an absolute slog to trudge through, several times I wanted to quit narrating the series because the writing was …. well, the author really could have cut 50K+ words out of every novel. But the story was actually very good, so basically, as a friend said, I got to spend those many recording booth hours “polishing turds”. Because of the dramatic read a narrator can put into the acting of the book, the listener is caught up in the auditory imagescape of the story. Since they are seeing full fleshed imaged in their minds and not the text itself they don’t catch the actual words, but the emotion and context…unless they have subtitles turned on in their heads, then they’re screwed. In the end, that one poorly written great story series, contracted as a royalty share deal with the author, has paid my mortgage every month for nearly 4 years now. Basil, how amazing. It’s great to learn all this from you, and I know other readers will be glad to have your thoughts cap off the discussion. The story about the series that needed editing, but makes your mortgage explains so very much. I’m relieved to hear the there’s a good, technical reason I still enjoy some audiobooks though the writing makes me cringe. It rather evens the playing field for some authors I expect. Most successful books are going to be made into an audio book. An author should have a handle on the contractual amount of control he/she has in the production of the audio book, or demand and negotiate it. The narrator makes or breaks it. Can you get a famous well trained actor to do it? Worth a try if you can pull it off. Personally, I like to turn the pages and smell the ink. However audio book planning should be part of a whole strategy to get your story to its biggest audience with nothing left to chance. Because I come from the music industry, expectations will be high that the audio version of my thriller will be first rate. I won’t leave anything to chance, particularly when casting the narrators. Nice to see this important and growing topic being brought up here. We have a family member who gradually became blind after retirement. Every year, I purchase him an audio book and/or music he enjoys. I always wanted to read for audio books and continue to research it as a project.